I wish so much you had written down your thoughts back in May, because this is one of my top books of the year and it really blew me away. I loved the way it ended and I loved the idea of a dystopia where no one is manipulated, brainwashed, or tortured. I could definitely see why their society evolved to be what it is, and I found the world very believable. I remember in my review I even said that in some ways, I thought the unit Dorrit was in sounded almost like a kind of paradise at times! I still think about this one all the time even though it’s been almost six months since I read it. I remember getting really cross with this book! There were so many holes in the plot that nothing was believable. It is a shame because there were some good plot ideas floating around. I agree with almost all the points you make – the only one I disagree with is that this is more enjoyable than Never Let You Go. I think Ishiguro’s book is far supierior, but we can’t agree on everything 🙂 and overall it sounds as though this was a fairly average read for both of us. 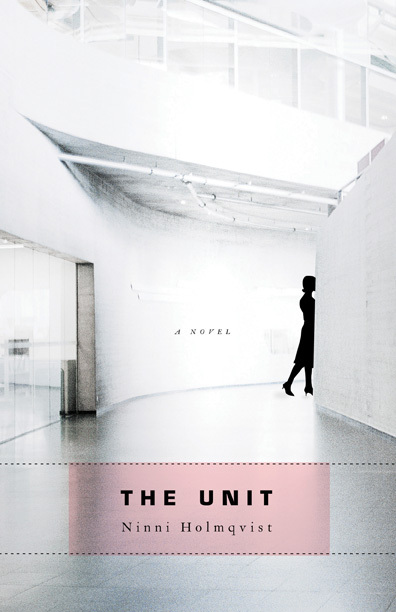 I quite liked The Unit when I read it, largely because of the setting that you’re so impatient with. 🙂 I was struck by the complete reasonableness of this world that Holmqvist created, so reasonable I was like, why don’t we do that, and then I was like, oh yes, I see that there are some downsides. And I read it about a month before Never Let Me Go, so I was sorely disappointed by the latter, even though I recognized that it was good in its own way! Is it mean to say I’m glad someone else has as bad of a memory as I do? I’m always looking up book synopses (is that the plural?) to find out character names. If I took notes, it would help, but I’ve never been able to get in the habit. While I was reading this, I was thinking how similar it sounded to Never Let Me Go, which I liked a lot. I have been very curious about this book, and at one point there was a lot of blog hype over it, which sort of made me a little less eager to read it. Seeing that it was sort of forgettable to you also makes me wonder again if I want to invest the time in reading it, or pass it up. I admit that the premise intrigues, but I am not exactly sure if this one would tread the same ground that I have already walked with Never Let Me Go, so I remain unsure. @ Amanda: Trust me, no one is more disappointed about this missed entry than I am! I am thinking I might have read this around the time when I was starting to feel really burned out and exhausted and so I must have finished the book late at night before going to bed and thought to myself I’d enter it in my log the next day and then promptly forgot about it. I know this one was one you really enjoyed so I hate that my memory of it is so hazy! @ Alison: Everything I posted here about the book must be taken with a huge grain of salt since I can’t fully remember my reactions, but I do think that while I found elements of the world interesting, I wanted to know more about the characters and how they felt about the situations they were in. That’s the part of the novel that felt most universal to me anyway, this concept of how we determine a person’s worth on both a personal and objective level. @ zibilee: I do think that although there are some superficial similarities between this and NLMG, it is not entirely appropriate to compare the two, because there are some important differences between the two as well. As I said to Jackie, I personally thought this book was a lot more evocative and emotional than NLMG (which I guess I would say might ultimately be more haunting), but I think in some ways the two suffered from feeling overly shallow. I think there would be elements that you would appreciate here if you ever read it, but that said, I’m not sure you need to bend over backwards to do so! Your memory is pretty impressive, if you ask me! I totally totally agree with your final paragraph! I applaud you for being able to assemble a review after this many months! I skipped the spoiler paragraph but the premise of the book is enough to make me want to read it. Steph, I think you remembered quite a bit for having read it months ago – great review 🙂 As far as the book itself – I loved it! It was one of my favorite reads and one that really stayed with me for quite some time. Definitely enjoyed it more than Never Let Me Go. @ Jill: Ha! I’m glad someone thinks my mind is something other than a sieve! 😉 I think I remember a lot of what happens near the end of the book, but not too much about the beginning, and many of the nuances are now lost to me (and character names! )… then again, I guess most of the action happens near the end, so perhaps it’s ok that most of the start is a blur to me now! @ Nadia: I do remember you enjoyed this one quite a lot, which is certainly part of why I picked this one up when one of our Borders was doing its bankruptcy sale. I think I always have ridiculously high expectations when it comes to dystopian fiction, which I am sure didn’t help in terms of my overall reaction to this one. This book sounds very interesting, but I am not sure that I am ready to read another book about organ donation so soon after NLMG. Probably, need to give it some more time. @ Nishita: I think this book is an interesting complement to NLMG but I think you’d do better to have a break between the two so that you can experience The Unit as its own book.